/ How Can I Try Out Twitter Dark Mode? How Can I Try Out Twitter Dark Mode? I’m so tired of black letters on a white background. I know “dark mode” is becoming popular, but is there a way I try out dark mode on Twitter? There are more ways to access your Twitter stream than there are leaves on a tree. Well, depending on the tree and season, of course.  But there really are a lot of third party apps and programs that let you interact with the Twitterverse without ever using any programs directly from Twitter itself. 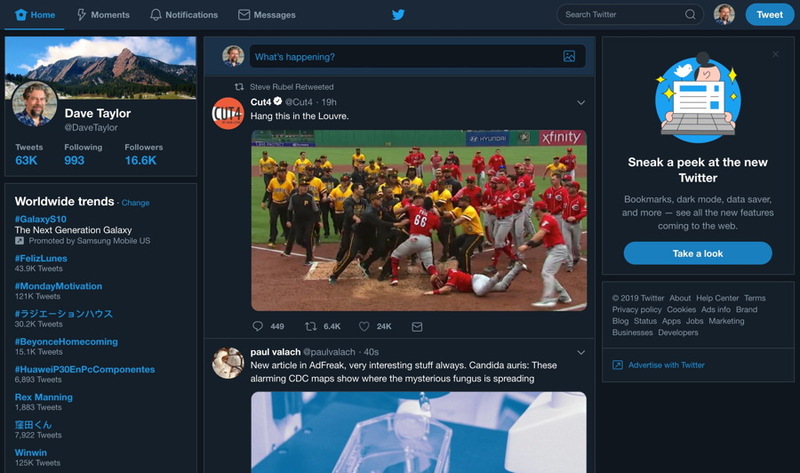 For this answer, however, I’m going to show you how to switch your Web-based Twitter user interface to dark mode and also give you a sneak peek at the new Twitter interface coming for later in 2019 too. If you’re using a specific app on your Windows, Mac or Linux system, or are on a mobile device, none of this will apply but you should poke around in the settings of your app anyway as it’s possible this feature snuck in without you realizing! 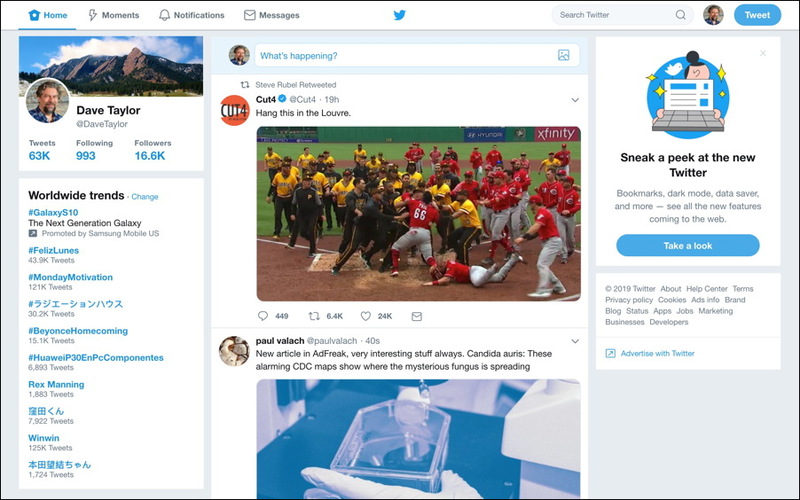 Having said, that I will note that I’m a fan of the Twitter Web interface as it’s simple, elegant and looks identical on every computer I use. Plus no worries about third party sites or developers gaining access to my login and account credentials. Basically the entire left column about your own account stats and info has vanished, leaving more space for Twitter and your tweetstream itself. There are more changes behind the scenes – and you can disable Dark Mode and stay in the new UI if you want too – but it’s not a massive update in terms of the user experience. 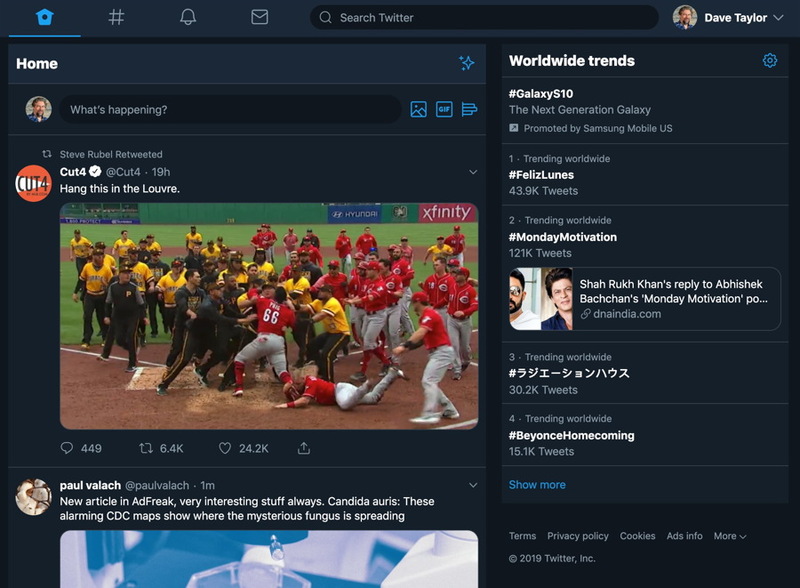 But… ya gotta admit, that dark mode with the new UI is looking pretty good for your Twitter stream, and pictures in the trending box? That’s new too! Pro Tip: I’ve been writing about Twitter since the service launched and have tons of Twitter help here on the site. Find me on Twitter as @DaveTaylor too and we can chat.